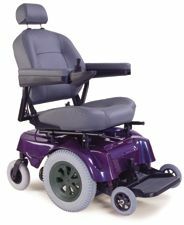 The New Jazzy 600 featuring Mid-Wheel 6 Technology utilizes Pride's original, patented mid-wheel drive with enhanced stability. Mid-Wheel 6 technology incorporates ATX Suspension for extra stability with independent active front casters that raise and lower as needed to compensate instantly for changes in the terrain. Spherical shaped front casters prevent hang-ups and allow for stable transitions from one surface to the next regardless of the angle of approach. Mid-Wheel 6 technology provides superb true all-around performance with the added benefit of 6 wheel stability. Whether transitioning curbs, climbing through rough terrain or reverse handling, Prides Mid-Wheel 6 consistently excels in performance. ATX suspension incorporates front casters for enhanced performance over rougher terrain. Side Mounted, easily accessible freewheel levers. 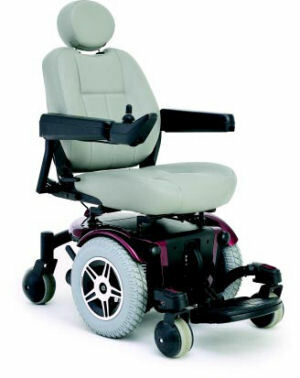 Nylon wheel spheres on front and rear casters to prevent wheel hang-ups. Easily accessible side charger port. New 75 amp. Pride Flight controller. Large 14" drive wheels for rough terrain.